It has a GTK+ front-end, the QT port is almost complete and has an applet just for systemd so applications can depend on dhcpcd saying "network ready". Could we plase get an ebuild of the development version. I don't want DBus, but once I have a chance to test dhcpcd-ui without DBus I would create the requested wiki page. New ebuild for dhcpcd-ui-0.7.1 posted on the bug. As version net-misc/dhcpcd-ui-0.7.4 is now in portage. Some questions about it. As it seems not possible to compile with the icons USE flag disabled, why does it have this USE flag at all? Am I missing something in qt4 setup? How to make it work? With gtk it's normal. I queried that. A gentoo dev wanted that. Icons are only needed for GTK and QT builds - when building dhcpcd-online tool no icons are needed. If it's greyed out then it means that it cannot communicate either with dhcpcd privileged socket. Should it be possible at all? I would say that's a bug with the ebuild. QA Notice: This package installs one or more .desktop files that do not pass validation. It's telling is that Gentoo QA is out of date with regards to Cinnamon desktop entries. Authorization for wpa_supplicant and dhcpcd config files are the same. 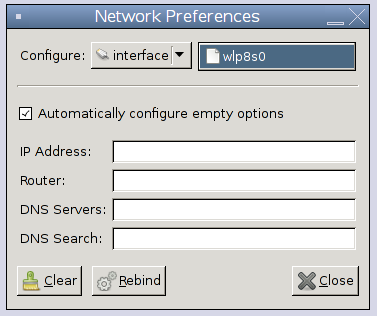 But wpa_gui can write to its file and dhcpcd-gtk still shows "Permission denied" https://529020.bugs.gentoo.org/attachment.cgi?id=389164 . How to get rid of "Permission denied"? 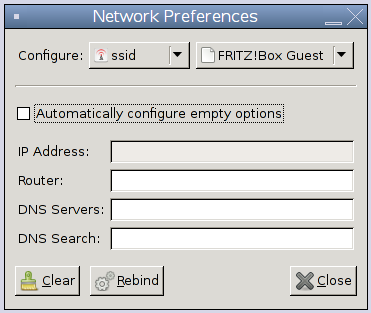 The difference is that wpa_supplicant writes to the configuration from itself, so it has root access. dhcpcd-gtk however, writes directly to dhcpcd.conf instead of getting dhcpcd to do it, so you, the user, needs write permission. Each time I try to select one of them or to switch to another I am prompted for the password aka psk. How could I avoid this for APs that already have their psk in wpa_supplicant.conf? !!! The ebuild selected to satisfy "net-misc/dhcpcd-ui" has unmet requirements. - net-misc/dhcpcd-ui-0.7.4::gentoo USE="gtk icons libnotify qt4 -debug -gtk3" ABI_X86="64"
Yet it still insists on bringing in gtk alongside qt4. I am not anti-systemd; I am pro-choice. If being the latter makes you feel that I am the former, then so be it. Maybe future versions will grow a forget option to avoid this. It can write network sections to wpa_supplicant.conf and details for static IP address to dhcpcd.conf. Caution is still needed to not overwrite existing items. Before new entries are written to wpa_supplicant.conf or to dhcpcd.conf or existing entries are changed we should have the possibility to abort or to save. 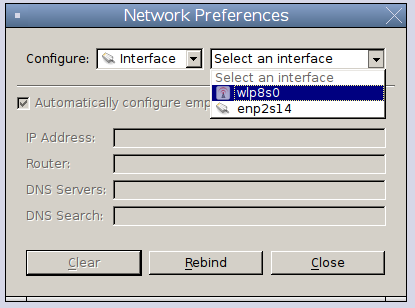 I really like this direct access more than first opening wpa_gui, then clicking "Manage Networks". Please file Gentoo bugs on this. Why not add section on the wiki for feature requests so I don't loose track of them. You'll need to login as anonymous to append to the page. Ok, I'll try extending the todo list. Another difference between dhcpcd-qt and dhcpcd-gtk, is this by design or also from the bug? I had a look at it this morning, but it looked fine to me? Maybe fixed in the next release.